Valentine’s Day: traditionally the day for all things lovey-dovey. What better way to show AlphaMale how much I love him than to serve up a special little Dinner a Deux? And what a dinner it was…. Easy peasy, done this one before. The recipe is on Dinner a Deux 2, posted on October 16th. But here’s a little reminder of how yummy it looks. 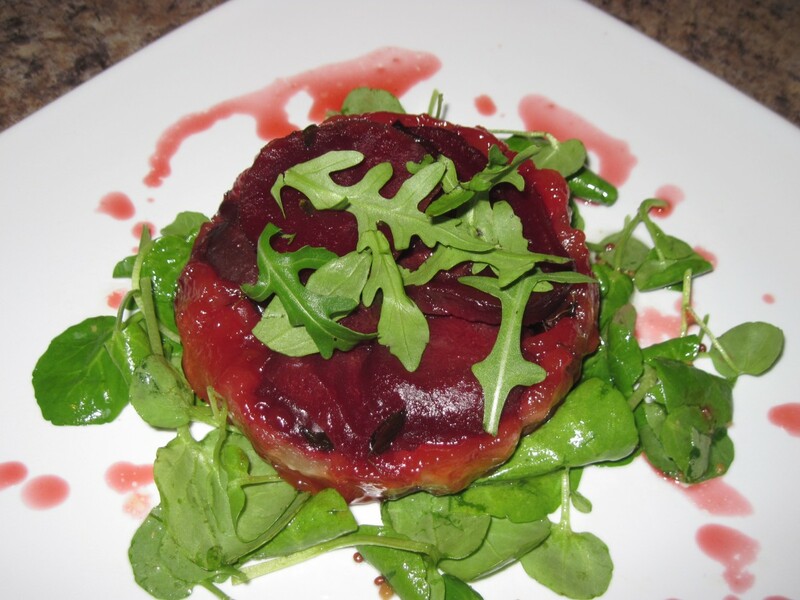 The flavours are an amazing combination of earthy beetroot and sweet but sharp balsamic caramel, all set off by the combination of peppery rocket and watercress. Absolutely delicious, and can be made ahead or frozen. Warm a small frying pan and heat the coriander seeds over a medium heat, shaking frequently, until they are aromatic. Grind in a pestle and mortar. Add the sumac, lemon zest and salt; mix well and smear over the salmon. Set aside for half an hour. Combine 1 tsp lemon juice, 1 tbsp olive oil, apple and fennel fronds; season and set aside. Heat either an oven-proof skillet or a small frying until hot ( if you are using a frying pan, have a small roasting tin ready in the oven). Add 2 tbsp olive oil, and when hot, place the salmon in the pan, skinned side uppermost. 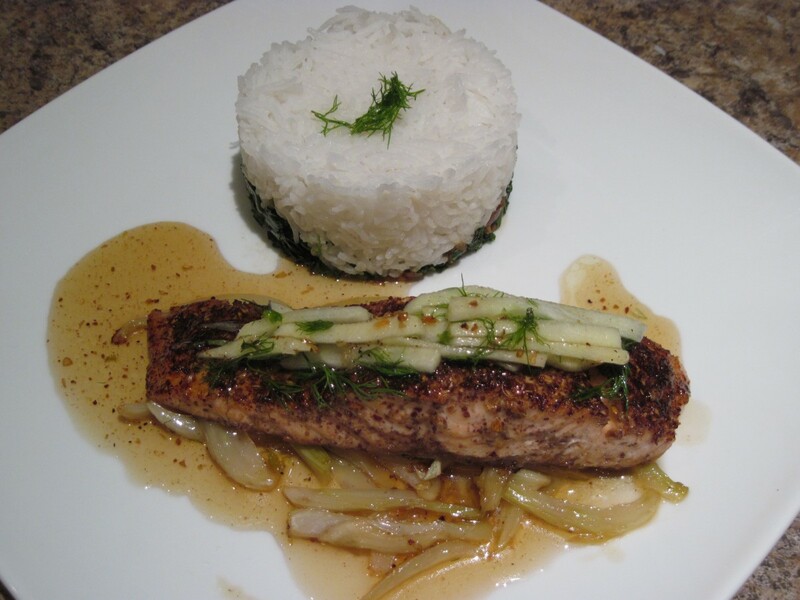 Arrange the fennel around the fish. Sear for 2 minutes, without moving, then flip over and place the pan in the oven. If using a frying pan, slide the contents into the hot roasting tin. Roast for 6 minutes, then remove to a warm plate and cover with foil. Check the fennel is cooked: if it is too crunchy, return to the frying pan for a few more minutes. Add the honey and lemon mixture and bring to the boil, scraping the browned bits of spice from the pan. Stir well to coat the fennel with the glaze. Season to taste. 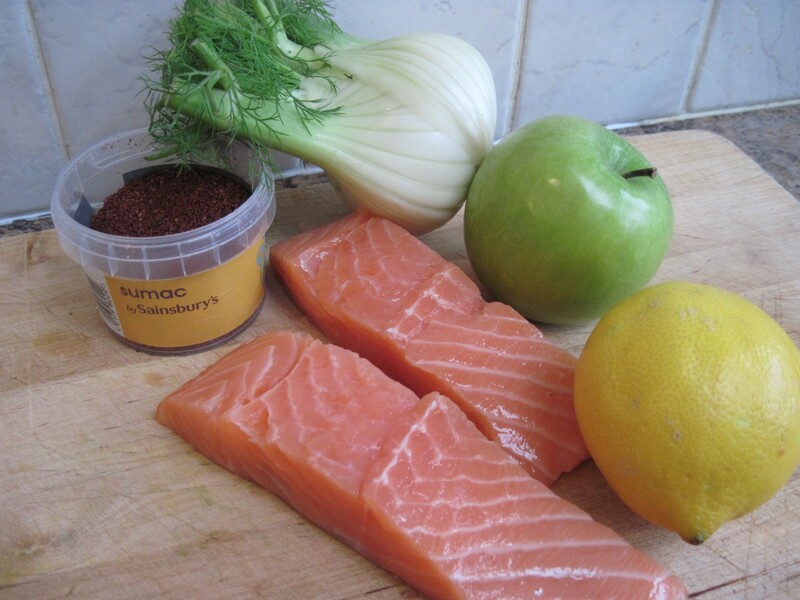 To serve, place a spoonful of fennel on a warm plate, top it with a salmon fillet, then add the apple salad. Drizzle with the remaining glaze. 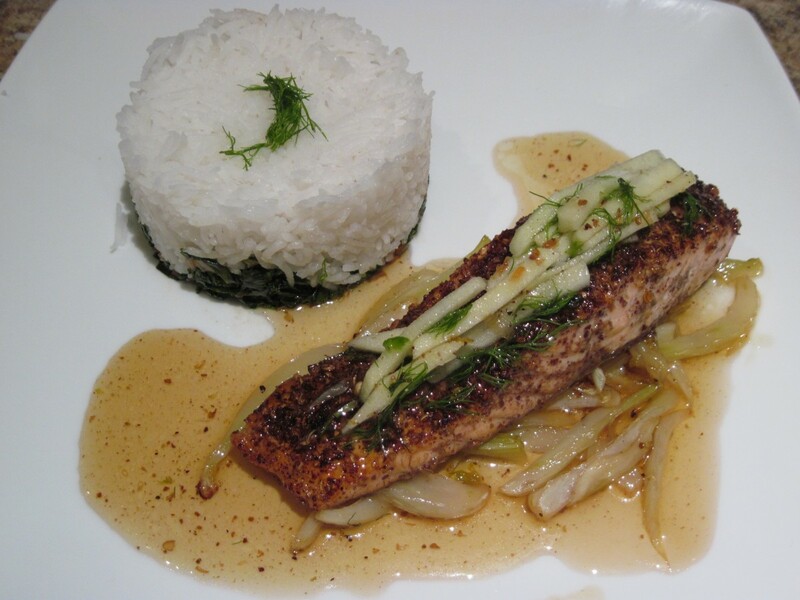 I served mine with boiled Basmati rice, on a bed of stir-fried kale to add some extra colour. Before starting, melt 1 tbsp of butter and use to brush the inside of the moulds. Dust liberally with cocoa and shake well to completely coat. Meltelt the chocolate and butter in a small bowl set over a pan of hot water, remove from the heat, stir well and set aside to cool for 10 minutes. 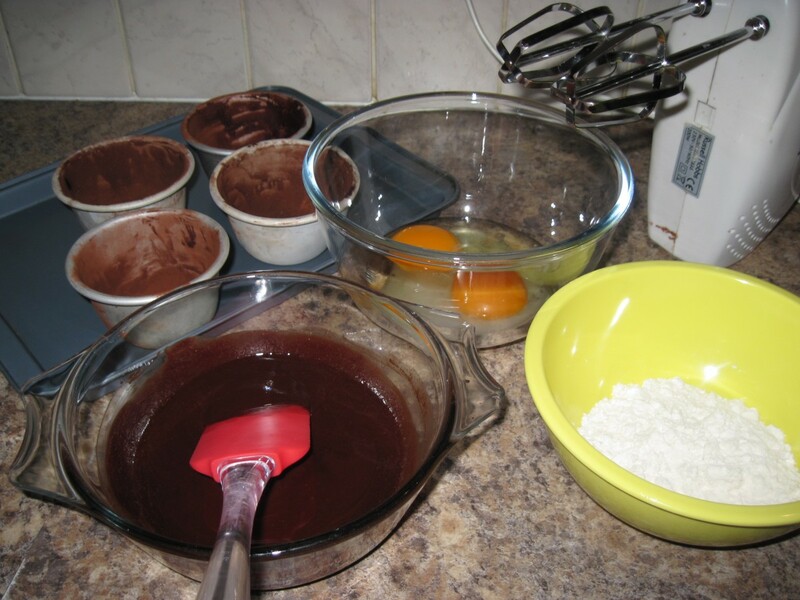 Whisk the whole egg, egg yolk and sugar together until pale and thick, then stir in the cooled chocolate mixture. Sift in the flour and fold to combine. Pour the mixture into the prepared moulds and bake for 9 minutes. (NB the recipe says 12 minutes, but I found mine were originally too well done. It’s all a matter of trial and error I’m afraid). Turn out on to serving plates dusted with cocoa. 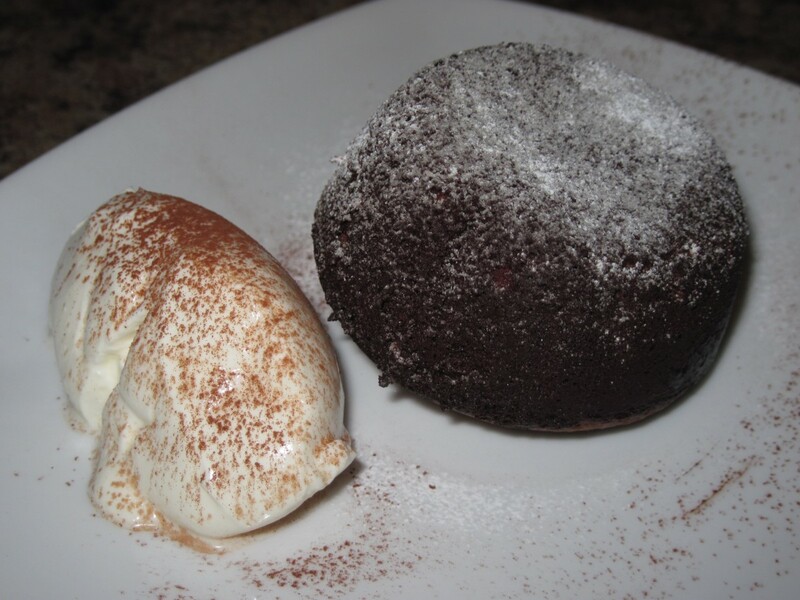 Dust the tops with icing sugar and serve with either creme fraiche or ice cream.